Released just in time for the 2014 Christmas rush, the latest addition to Play'n Go's impressive arsenal is full of seasonal cheer and certainly comes bearing gifts. If you've played Microgaming's excellent seasonal slot Deck the Halls - now also a cracking mobile title - you'll get the vibe instantly. On the 5 reels there are 15 paylines to bet on, with the snowy background bestowed by symbols depicting beautiful-looking wrapped gifts, candles candy sticks, glasses of mulled wine, bells, reindeer, baubles and a jolly Santa. This is one of the more traditional-looking Christmas-themed slots out there and will certainly stir some feeling of nostalgia. There are four Wilds to look out for - the 2x, 3x, 4x, and 5x icons - and these substitute for all regular symbols except the Scatters. Your win is multiplied depending on the Wild, or Wilds, that fall to form a winning combination. Check out the pressies as those Bonus symbols activate the bonus game when you land any three anywhere. There's a green present with a red bow, a yellow box, and a gold parcel with a purple ribbon, so it's worth looking out for them. It's the only bonus round in the game, but hit it and you'll get to choose from one of the three presents to reveal your festive treat. There are different coin amounts in each one; choose well and you could be rewarded with a juicy payout. For a visual feast, you can't go wrong with Merry Xmas. As well as some pretty generous Wilds, the symbols come stacked on the reels for bigger, more regular wins. However, I would have liked to have seen the Scatters crop up more often. It took me an age to activate the bonus round. Do that, though, and there's a chance of hitting a jackpot worth 150x your total bet. As it is, this is a game for nice base game wins. With the Wilds and stacked icons I regularly hit 200-coin wins on a payline, and with payouts like that you'll be ho-ho-ing all the way to the bank. 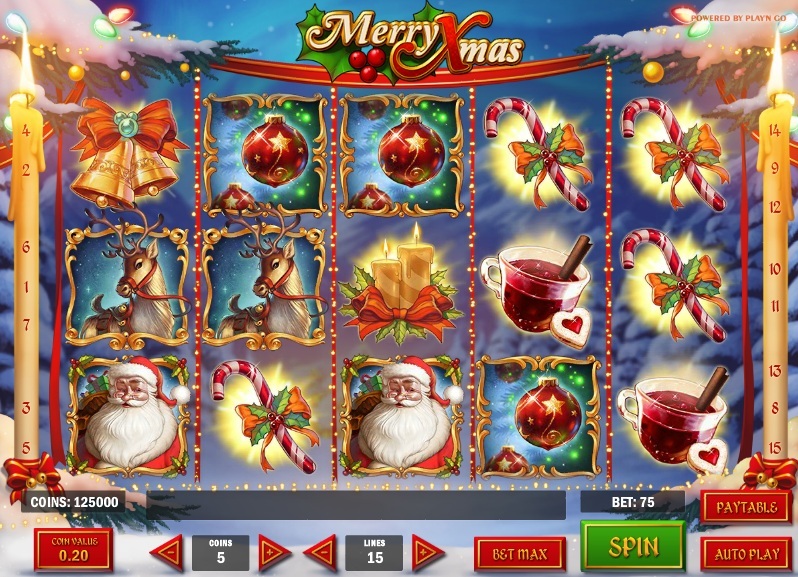 If you want more festive-themed slots gaming then you can't go wrong with Microgaming's Secret Santa slot.